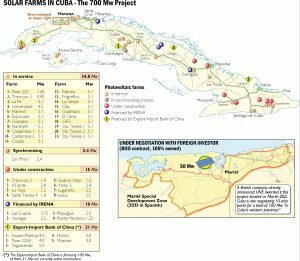 CUBA STANDARD — Cuba is amid negotiations with foreign investors for the construction of 150 megawatts of utility-scale photovoltaic projects, and another 200 mw may be up for grabs eventually, Cuban officials announced. 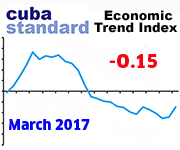 According to the standard of $2 million per mw Cuba uses in its investment portfolio, the total cost of the projects under negotiation would be $300 million. All these solar farms are to be owned 100% by the foreign entity under build-own-operate (BOO) contracts, with state utiliy Unión Eléctrica (UNE) as the sole buyer of the electricity, paying a fixed negotiated rate. Some 150 mw are currently under negotiation, and there is a total potential of more than 200 mw for foreign investors, said Miguel Pérez Rodríguez, general director of EDIFRE, the state engineering company in charge of building solar farms. The results of the negotiations are expected to be announced at the Havana International Fair, Oct. 31-Nov. 4, Pérez told potential investors during the Energy & Infrastructure Summit Sep. 1-2 in Havana. UK-based Hive Energy already announced it will build a 50 mw solar farm at the Mariel Special Development Zone. Using the international standard of $2 million per mw, the total cost is estimated at $100 million. The Mariel project will consist of three different locations with at least 15 mw each; completion is expected for 2018. Hive could not disclose the project cost because it is still finalizing terms with UNE, Bernardo Fernández, Hive Energy’s Mexico, Central America and Caribbean director of operations, told Cuba Standard in June. 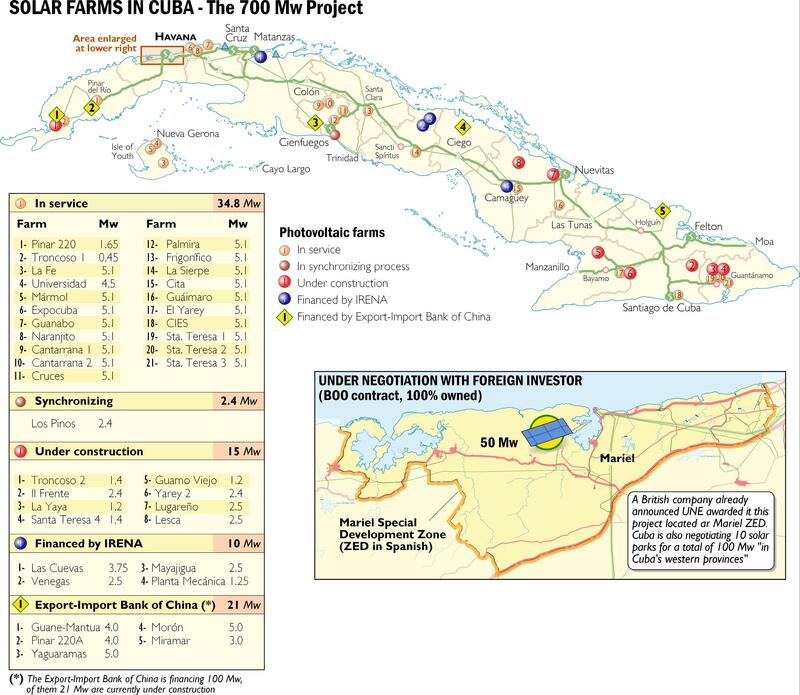 According to the most recent foreign investment portfolio, UNE is also seeking foreign investors to build and operate 10 photovoltaic parks totaling 100 mw in Cuba’s western provinces under BOO contracts, for an initial investment of $200 million. “Hive has also expressed interest in these projects and will be tendering them as soon as the official tender documents are published,” Fernández said in June. The foreign investment projects join more than 150 mw in solar parks currently under construction by EDIFRE. They will be owned and operated by UNE (see map). Using a loan from the Export-Import Bank of China, EDIFRE is planning to build 40 solar farms totalling 100 mw. Construction of 21 mw is already underway. Also, EDIFRE is building an additional 15 mw worth of solar farms using other funding. In October last year, the Abu Dhabi Fund for Development (ADFD) provided a $15 million concessionary loan to build solar farms in four provinces for a 10 mw total. Finally, Cuba has secured funding from the International Renewable Energy Agency (IRENA), for a total of 10 mw in four photovoltaic parks. Top priority are sites in isolated areas such as islands with tourism infrastructure, as well as the Mariel Special Development Zone, and other areas that can easily plug into existing power lines, Pérez Rodríguez said. The state company is also developing battery-based, off-grid photovoltaic projects to electrify 20,000 buildings in isolated areas. EDIFRE, the Spanish acronym for “Investment Development Company for Renewable Energy Sources”, was created in March 2015 and belongs to the Ministry of Energy and Mining. The state company provides engineering, design and consulting services, and is in charge of negotiating with investors bidding for solar farm projects. EDIFRE says it is using as much as possible Cuba’s existing photovoltaic panel manufacturing capacities; a state-owned plant in Pinar del Río will add a second assembly line, boosting capacity from 15 mw of panels per year to 65 mw per year. 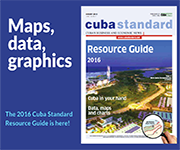 Projects are also encouraged to use Cuban-made metal structures. Cuban individuals and private entities — both Cuban and foreign — with renewable-energy devices will eventually be able to feed power into the grid, a Cuban electricity policy maker said during a conference in Havana. Ramsés Montes Calzadilla, Director of Electricity Policy and Planning at the Ministry of Energy and Mining, said that private entities may soon feed into the grid run by state utility Unión Eléctrica (UNE). That could include Cuban entities such as agricultural cooperatives or building owners with large roof surfaces. He did not give a timeline for the policy change. Currently, foreign investors are negotiating feed-in contracts with Cuba’s state utility for hundreds of millions of dollars worth of renewable-energy projects. But this would open the market to small-scale electricity purchases by Unión Eléctrica (UNE). To be sure, the obstacles — political, technological and financial — are formidable. Even so, this venue could provide additional revenues to private farmers and cooperatives, or companies with large-roof buildings. 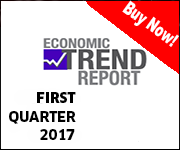 This entry was posted on Saturday, September 10th, 2016 at 7:37 pm	and is filed under Economy. You can follow any responses to this entry through the RSS 2.0 feed. Both comments and pings are currently closed.